Our week in Bulgaria began at the Life of Victory Christian Centre in Russe with Pastor Ilia and our hostess, Lyubka Tancheva (on either side of Kelly and John). Our teaching on the Restoration of All Israel was enthusiastically received and many from this young, vital congregation came forward for prayer. A foundation was laid here for blessing and support of Israel and seeds were planted for a teaching conference in the summer of 2012. 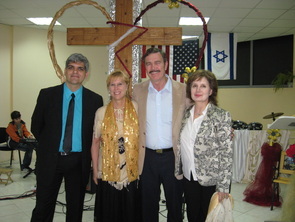 ​We also ministered at the Sofia Christian Center in Sofia with Pastor Vladi and experienced powerful worship there, as well as more enthusiasm for learning how they are grafted into the Olive Tree of Israel.